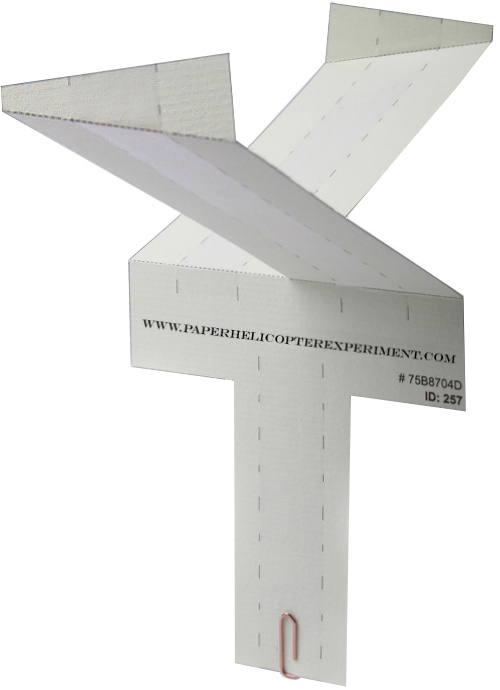 This website is devoted to the paper helicopter experiment - a project which became an integral part of every modern course on Design Of Experiments. The paper helicopter experiment lab provides efficient and fun way of learning material relevant to the course. By completing the project you will become familiar with the fundamental concepts of experimental planning and gain knowledge of the theory behind two-level fractional factorial designs. The project is designed to imitate industrial needs and requires generating real data. In order to do that you may consider using printable paper helicopter templates provided by this website. At our paper helicopter factory you may customize the helicopter design to suit your needs by setting values of factor levels and other parameters. Once done, simply fill in the design matrix and print out the PDF with the paper helicopter patterns. The paper helicopter experiment project is an excellent assistant in teaching statistics and linear regression within the Experimental Design course. You are invited to integrate the project into your own syllabus. If you find this website useful - please put a link to www.paperhelicopterexperiment.com on your course homepage. The problem statement is given in the Project section, an overview of the paper helicopter design and assembly instructions can be found in the Design & Assembly section, and printable Patterns will save hours of work and ensure that paper helicopters are produced in perfect agreement with the specified dimensions.